Open review approach gives credit to reviewers for the time and effort they put into improving the quality of the manuscript and shows the community that the journal is running a proper peer review process. 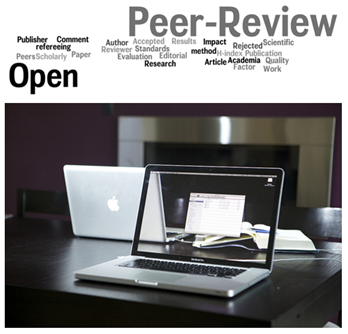 What is open peer review? What are the benefits and challenges? Should peer review reports be published and champion transparency in the peer review process? ‘Traditionally the peer review process has been closed and reviewers – and their reports – have remained anonymous and locked away, even long after review. While this is still preferred in many cases, some pioneering journals are taking part in our trial to publish peer review reports as articles, next to the research they review’ (Elsevier). ‘Often, the closest “peers” in someone’s area of research are also that researcher’s direct competitors! One solution is to remove the authors’ names from the manuscript, but this double-blind system is not fool-proof, and a reviewer will still often recognize which lab a paper comes from. In addition, any bias towards competitors of the reviewer still remain, even if that competitor is anonymized. Another drawback of traditional peer review is that the referee reports are visible only to the authors and the editor’ (F1000Research). With open peer review referee reports are made publicly available after the peer review process: each published article includes all peer review reports, reviewer names, and author responses – even for articles that are still under review or revision. Ultimately, open review process which decides whether research is suitable or ready for publication. The benefits of open review - for authors, readers and reviewers - are indisputable: author can see who reviewed their work; reviewer comments put paper in context which is useful additional information for readers; bias among reviewers are reduced; reviewer’s informed opinion of the work is showed; reviewer’s experience is demonstrated, etc. Thus open review peer review can be seen as a supportive and collaborative process between referees and authors, as well as an ongoing dialogue (rather than a selection system) between groups of scientists to progressively assess and predict the quality of published research. The Atmospheric Chemistry and Physics journal publishes pdfs with peer reviews alongside the final version of the paper (example article). F1000Research also publishes referee reports (example article); Molecular Systems Biology publishes a “Review Process File” (example). In BMC Cancer the reviewers’ names are published with the review reports (example). The journal Royal Society Open Science publishes reviewer reports under “Review History” for each paper (example). Peer and Nature Communications journals have a system where both the reviews and the names of the referees can be optionally made open. BioMedCentral includes both the reviewer names and the peer review history (pre-publication) alongside published manuscripts in the medical journals of the BMC series. The Frontiers series now publishes all referee names alongside articles, and EMBO journals publish a review process file with articles, with referees remaining anonymous but Editors being named. Royal Society Open Science make its referee reports public under an open access license, CC-BY. ‘Although open peer review is becoming more common, and addresses several of the issues of anonymous review, a few challenges still remain. A study in the early days of open review suggested that naming referees slightly reduced the likelihood of finding reviewers but did not affect the quality of review. Conversely, other studies suggest that open review provides more constructive reports’ (F1000Research). How do you feel about open peer review? We would appreciate hearing your opinion here!